The St. Louis Cardinals became a much more fun team yesterday, and they barely gave up anything to pull it off. 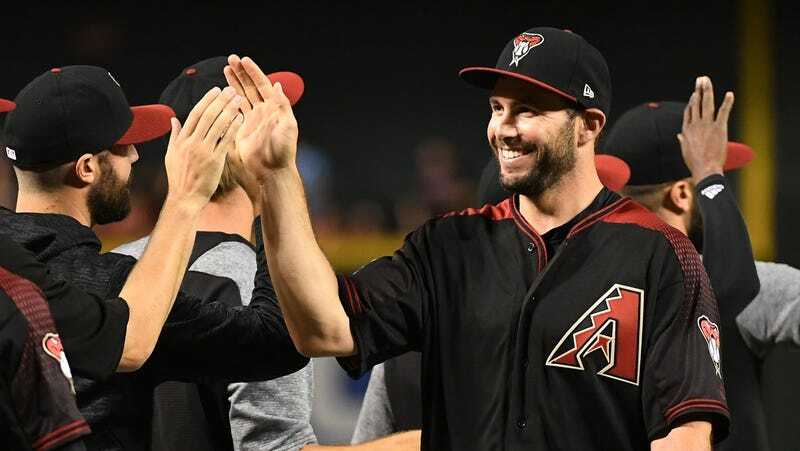 On Wednesday, baseball’s most uptight franchise sent three fairly irrelevant players to the Arizona Diamondbacks, who in return gave them big-time slugging first baseman Paul Goldschmidt, who was consistently one of the best players in baseball during his 7.5 years in Arizona. The Cardinals, who had the bad kind of dramatic year and finished 2.5 games out of the Wild Card in 2018, are only getting Goldschmidt’s contract for a year before he hits free agency, but given the pretty cheap price they paid, it’s a move they couldn’t pass up. Pitcher Luke Weaver still has upside at just 25 years old, but his 4.79 ERA over 233 career innings pitched means he’s clearly disposable, especially when his FIP numbers—particularly in 2018—don’t do much to acquit him. Catcher Carson Kelly was previously hyped as a future replacement for Yadier Molina, but he’s failed to hit at anything resembling a major-league level in a smattering of plate appearances across three seasons. Andy Young has hit well in the lower minors, but he’s still mostly a shot in the dark. For this quite uninspiring bunch, the Cardinals win the opportunity to pair Goldschmidt with Matt Carpenter and have two of the top-10 MVP vote-getters last season. Carpenter has been a deliciously good power hitter and leader for the Cards, and the 33-year-old’s 36 dingers last season was a new career high. Goldschmidt’s ability to hit baseballs to towering heights and faraway distances is his most immediately impressive attribute, but what helps makes this acquisition so wonderful for St. Louis is his consistency. Goldschmidt has played in 155 games or more in each of the past four seasons, and in those years his wRC+ has never dipped below 133. Since 2012, Goldschmidt’s first full season with the Diamondbacks, only Mike Trout has accumulated a better offensive runs above average than Goldschmidt. If team ace Miles Mikolas (who ate a lizard, I’m obligated to remind you) is able to sustain the success on the mound he had in his incredible comeback 2018, the Cardinals start to become a real threat. With the Cubs and Brewers keeping the Birds firmly in third place in the NL Central last season, they’ll need as much firepower as they can get. But outside of St. Louis, this is another depressing baseball trade. The move pretty much strips the Diamondbacks bare after an 82-80 season, with few bats to speak of other than maybe 31-year-old outfielder David Peralta, who’s had ups and downs in three full seasons. By losing top pitcher Patrick Corbin in free agency to the Nationals and sending away a superstar for a return that’s mostly theoretical at this point, the D-Backs become yet another team signaling their intent not to compete this year, and so soon after they went all out for a 2017 Wild Card berth. For fans in Arizona, there will be no real reason to watch their baseball team this summer, and there won’t be until the slow process of restocking cheap young guys potentially pays off. For teams that are actually trying to win the 2019 World Series, however, there appear to be plenty of bargains on the market.